Handmade Italian dishes prepared to order in a lively open kitchen. The herbs have been chopped, fresh vegetables have been washed, the brick oven is glowing, sauces are simmering on the stove, bread is baking, and the grill is flickering with heat. Good people and good food have been vital ingredients of life for generations of the Carrabba family, both back in Italy and here in America. It is the memories of these Italian family dinners – from cooking in a kitchen that was always alive with conversation, laughter, tastes and aromas, to the eating and enjoyment of a meal made with love – that inspire Carrabba’s Italian Grill, every day. 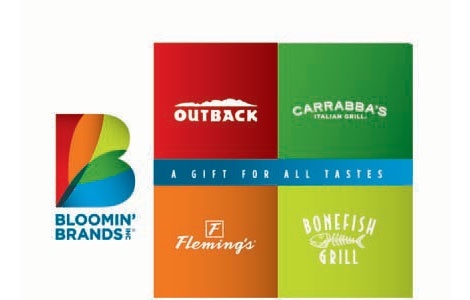 The Carrabba's Gift Card is also valid for use at all U.S .Outback Steakhouse, Bonefish Grill and Fleming's Prime Steakhouse & Wine Bar. For more information and sample menus, visit www.carrabbas.com . National Gift Card is the best place for you to order Carrabba's Italian Grill gift cards in bulk. We are the experts in all things gift cards and can set up your gift card solutions program for you today. Please contact us for more information on Carrabba's Italian Grill bulk, direct-to-recipient, or individual gift card fulfillment for your gift card program. Contact us here or call us at 888-472-8747 today!